On Thursday and Friday we celebrated St Patrick’s Day with a little round-trip jaunt of some 1600kms “Down the Track” as it’s known locally, or officially the Stuart Highway, towards Alice Springs. Actually the only connection is that when we finally arrived at our destination in Daly Waters, the pub had “Happy St Paddy’s Day” written on the bar refrigerators and a couple of Irish (and 1 American) bar-tending backpackers! So what’s so intriguing about driving down the Track? Usually when we do this trip we’re on a 3000+km trip interstate so it was pleasant to be able to do it without the deadline of many miles to cover. 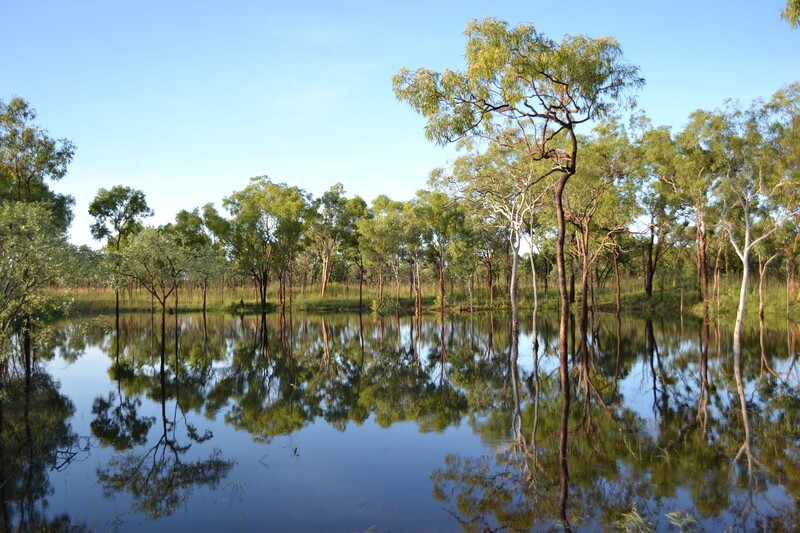 It was actually quite therapeutic having been cooped up in Darwin for the past five months while we’ve experienced a record Wet Season rainfall of over 2.5 metres leaving us feeling like we should swim down the track, not drive. Coincidentally this surpasses the previous record from the year we arrived in the Territory. As we set off on Thursday the fog hung over the road making it look like a wintery day…very strange. 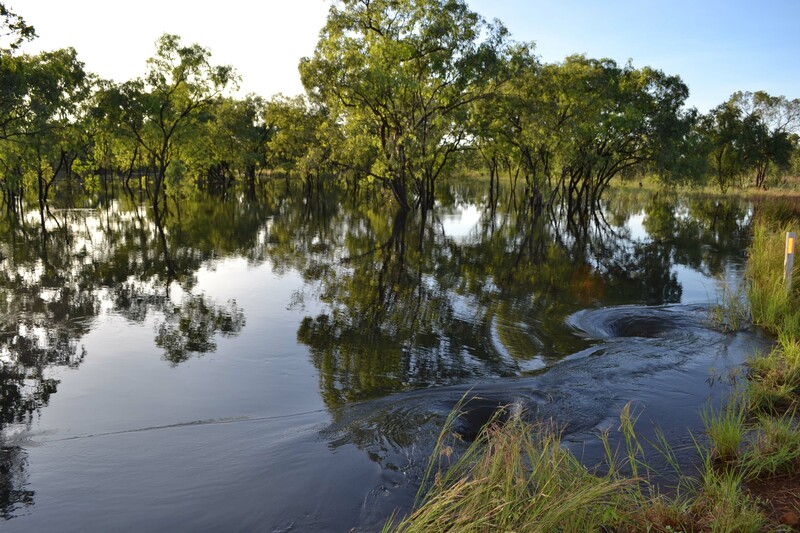 The huge rainfalls mean the Territory is looking green and beautiful with water along the sides of the road, huge billabongs visible in the bush, water over the road in some parts and a slalom course of potholes. We didn’t expect to see much wildlife thinking that they’d have plenty of tucker and water without coming too close to the road. Unfortunately that wasn’t the case and there were quite a few small wallabies that had fallen foul of passing trucks or vehicles, as well as a dingo and a large snake which was providing a great meal for some whistling kites (hawks). Each time we stopped to take photos, the bush was alive with the sound of bird-song. It was absolutely brilliant! We saw heaps of varieties along the way including white cockatoos, red-tailed black cockatoo, kookaburras, magpie geese, a jabiru and rainbow bee-eaters (quite my favourite bird along with pelicans). 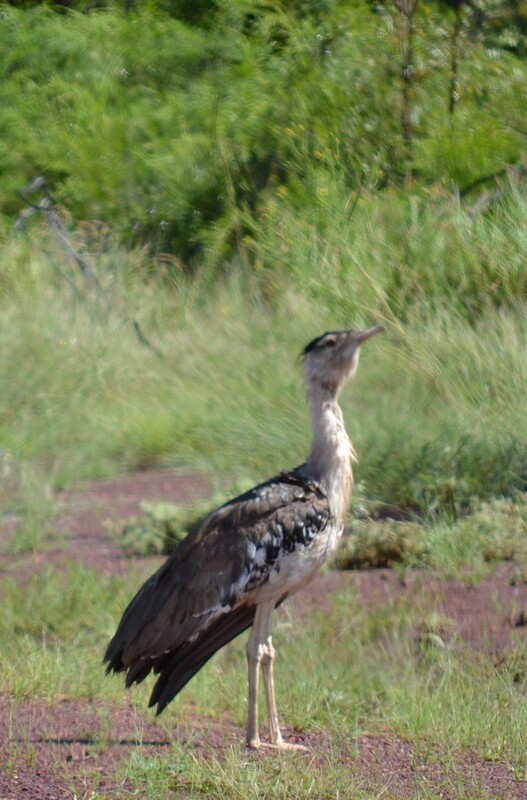 However the big sight for the day was a turkey bustard by the roadside. They are really big birds and we’ve only ever seen one before. (My daughter wasn’t so lucky a few years back when one slammed into her windscreen on a bush track – didn’t do the windscreen or the bird much good). The biggest hazard, apart from those potholes and a short aquaplane on one watery section, was all the birds that wanted to hang out on the warm bitumen as dusk approached. Birds are always a small hazard since they’re not going to harm you but I really hate hitting one, so with little traffic on the road we were able to be birdlife-friendly: apart from one little brown bird (LBB) which came from nowhere straight at us. The rainbow bee-eaters were sitting in small flocks on the road so I was most anxious to avoid them: there must have been insects at ground level. Our drive was also quite meditative watching the kilometres unwind before us. There was very little traffic on the road making it a major change from Dry Season driving which involves slaloming around what feels like a bazillion backpackers and grey nomads on the move in caravans and campervans. As the Highway is a two-lane road only for the vast majority of its length, overtaking can be tricky at speed and you need a good line of sight. On Thursday, over 970kms we passed 1 car, 1 campervan, and in close succession a triple road train and another road train transporting two halves of a demountable house. Naturally I was the lucky winner of the pass-the-road-train competition. Himself seems to miss out on this fun, but Friday it caught up with him when he also had two to pass! So what’s so challenging about this you might ask. Well a road train is an articulated lorry (in UK-speak) with two, three or four trailers. 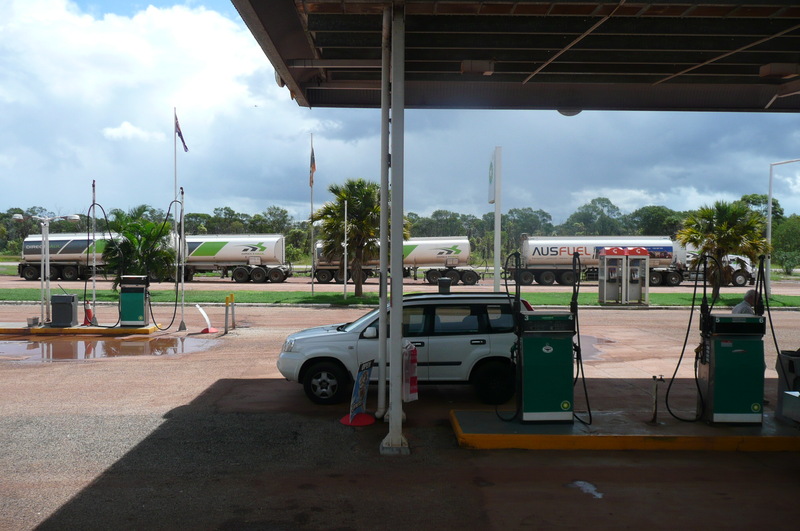 It used to be that you mostly saw three trailers but it seems reasonably common now to see four trailers, especially on road trains transporting petrol. (http://en.wikipedia.org/wiki/Road_train). Given the length of a road train (over 50 metres long) they take an inordinate amount of time and distance to pass even at speed and you learn to be very “sensible” before launching into overtaking. They certainly deserve a driver’s respect. This is a picture of one outside the Daly Waters road house with our XTrail in front of it. There were actually very few of them around this trip because the three main access roads were cut by flooding so the only route available was Darwin to the Three Ways or Tennant Creek (a distance of some 1100kms). I would not want to be on the Track once they all get clearance and are in a rush to get to Darwin having lost several days travel time. They’re very good drivers as a general rule and like the TV Promo “we share the road, we share the safety”, but they’re still scary to have to pass. 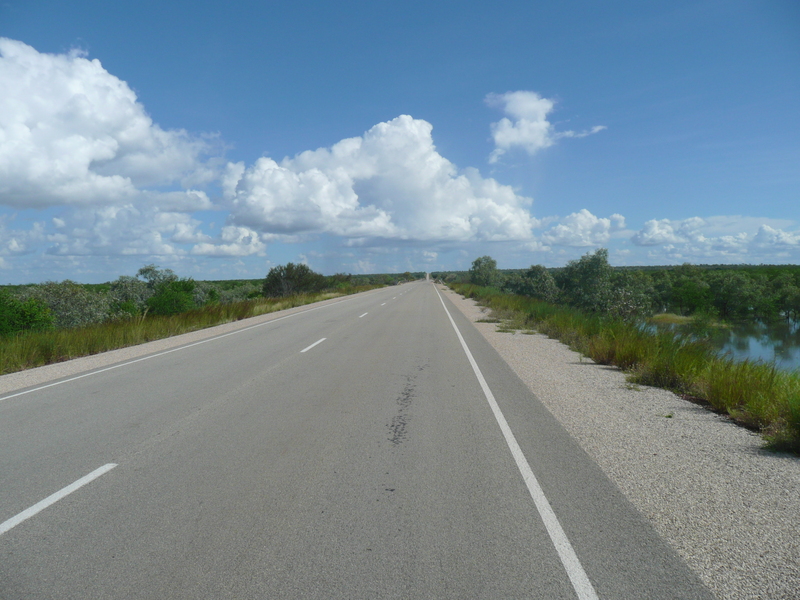 As a diversionary sideline, until January 2007, the Territory had no speed limit on the open road. Now the speed limit is 130 kph except through small towns and settlements (as far as I know the highest speed limit in Australia, but I could be corrected on that). 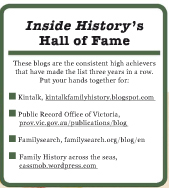 The road is also historic: there are the explorers, especially John McDouall Stuart, and the Overland Telegraph people who “opened” up the route. All along the road there are signs to World War II airstrips, and the odd military hospital, as this part of Australia was a primary defence line for the Pacific element of WWII. After the bombing of Darwin in 1942 this was taken particularly seriously. 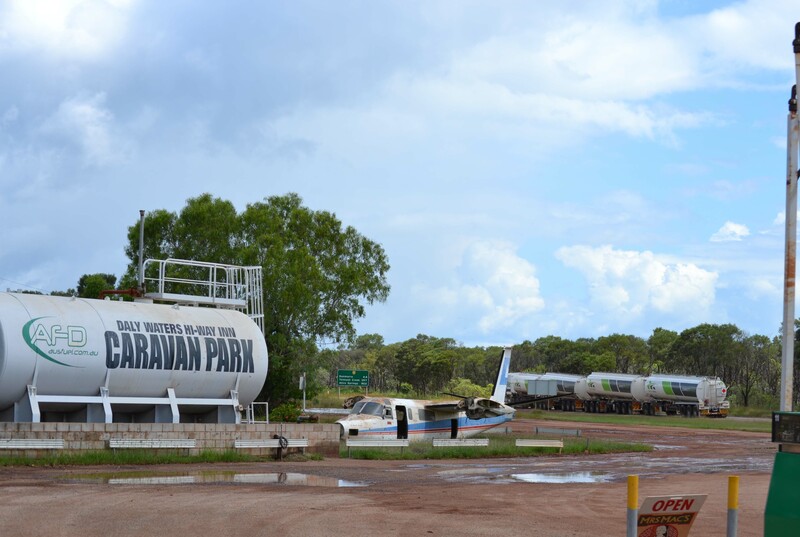 The Territory remains one of Australia’s primary defence locations with a number of Defence bases, and partly explains the generally excellent standard of the Stuart Highway. Along the 1500kms of the Stuart Highway from Darwin to Alice Springs, there are only two small towns – Katherine and Tennant Creek, and a few smaller settlements of varying appeal (Elliott continues to look daggier each time we go through while Mataranka seems to have improved in appearance with the new alcohol restrictions). Virtually all other stops are very small or just highway petrol stations combined with accommodation. The waterhole was tranquil but the whirlpools were rather scary. “Best” driver: the bloke with his leg up on the dashboard and no hands in sight. Hopefully he had the 4WD on cruise control and steering with at least one finger. Most beautiful scenery: the billabongs in the bush with long grass waving nearby. Silliest Skippy: the small kangaroo that kept hopping along the road in front of us instead of going bush! Prettiest trees: Melaleucas covered in white and lime-green flowers. 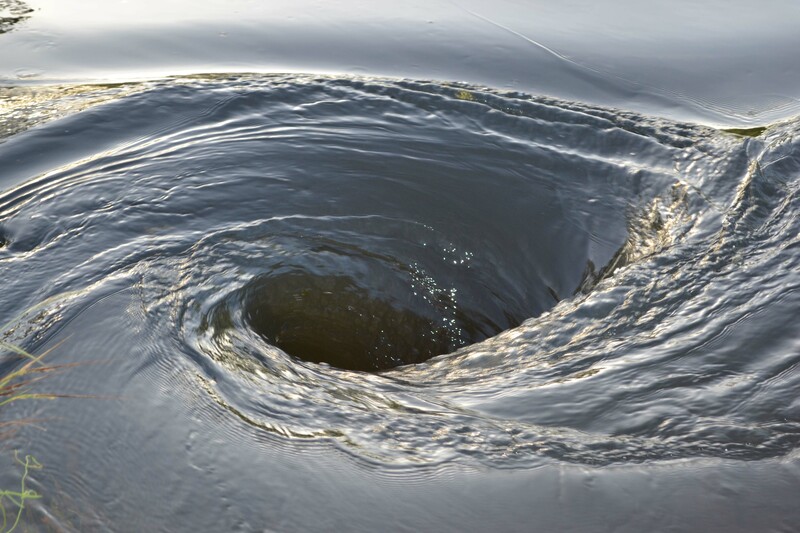 Weirdest sighting: Two swirling whirlpools as water from one waterway was sucked under a culvert to that on the other side. Biggest Omission: Not seeing that there were two pelicans around the dam where I’d photographed a big mob of cattle –until I got home and looked at the photos! Funniest: Watching the frilled neck lizard (frilly) run, in his pre-historic way, into the bush.